Welcome to The University of Texas at El Paso (UTEP)! Thank you for your interest in hiring UTEP students. You will find that our students are excellent candidates with attractive skills that will contribute to the success of your organization. 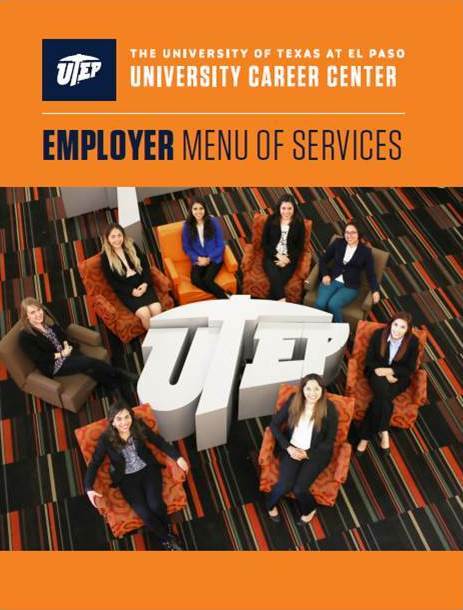 Count of the Career Center to help facilitate your job posting or visit to campus; our office serves the entire UTEP student population. Please contact recruit@utep.edu for assistance. UTEP is a member of The University of Texas System (www.utsystem.edu). It serves its primary constituency--residents of far west Texas, southern New Mexico, and northern Mexico—with 74 undergraduate programs, 76 master’s programs, 22 doctoral degree programs, and a growing portfolio of online degrees. With an 80% Hispanic student population— and an additional 4% from Mexico—UTEP proudly reflects the demographic composition of the binational region from which it draws 90% of its students. UTEP is comprised of six academic colleges (Business Administration, Education, Engineering, Health Sciences, Liberal Arts, and Science) and the Schools of Nursing and Pharmacy. Click the Employer Quick Links to make your search a bit easier!